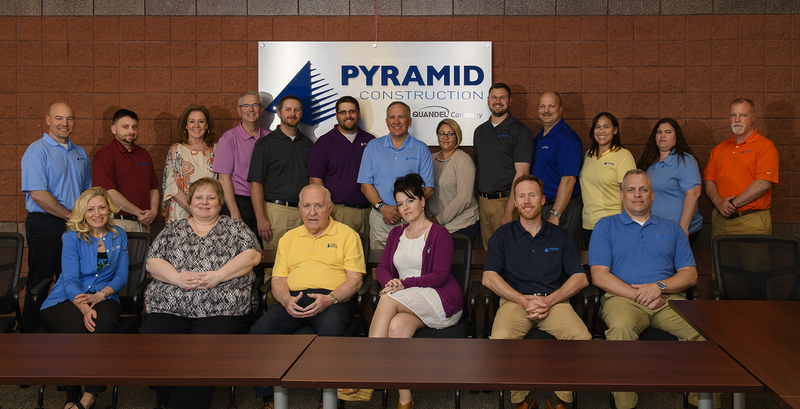 About Pyramid - Pyramid Construction Services, Inc.
With over 20 years in operation, Pyramid Construction Services, Inc. has built a reputation on superior customer services, quality construction and community involvement in the Central Pennsylvania marketplace. Every Pyramid employee embraces a “customer first” philosophy, from promptly returning telephone and email messages to servicing items beyond the customary warranty period. Pyramid provides a wide range of construction services to its loyal customer base. To help support its growth in the region, Pyramid became a wholly owned subsidiary of Quandel Enterprises in 2004. Today, with its main headquarters located in Wormleysburg since 2010 and a branch office in Hershey that opened in 2013, Pyramid consistently performs over 400 projects a year, with revenue averaging $60 million annually. Our experience in a variety of market segments, include, but are not limited to, health care institutions, higher education, medical offices, commercial offices, retail and nonprofit organizations, and all play an integral part in the well-being of the local community. Above all, the key to our success lies with our valued employees, a total of 75 construction professionals, two-thirds of which are stationed on various jobsites in Central Pennsylvania. We are as equally proud of our passion for giving back to the community as we are of our firm’s construction expertise. Pyramid has a rich legacy of service and investment in local community initiatives. We look forward to taking the next steps with your Team as your Construction Partner.